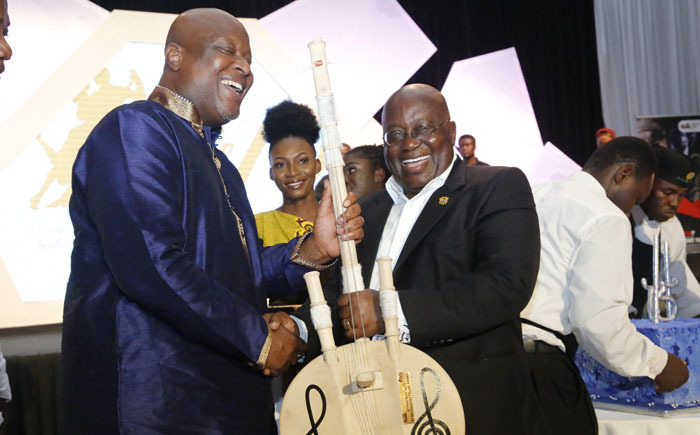 Rebecca Akufo-Addo presenting a citation to Asabea Kropa and brother at the ceremony President Akufo-Addo stole the show on Sunday evening when he graced the presidential ball organized by the Musicians Union of Ghana (MUSIGA). The event was to honour some music legends who have made invaluable contributions to the industry over the years. President Akufo-Addo took exquisite steps while dancing with his wife Rebecca. He personally donated an amount of GH₵50,000 to support the Aged Musicians Fund set up by MUSIGA to support ageing musicians. Vice President Dr Bawumia and wife Samira were excellent on the dance floor at the foyer of the Accra International Conference Centre (AICC).